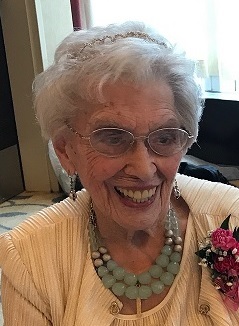 Obituary for Josephine Anzalone Noto | D.L Calarco Funeral Home, Inc.
Josephine Anzalone Noto, 101 years young, surrounded by her family, passed away peacefully at home on July 9, 2018 in Utica, NY. Josephine was born on May 30, 1917 and lived in Watertown, NY until she was 93, at which time she moved to Hilton Head Island, SC to be with her daughters, Nancy, Terri, Toni and their families along with frequent visits from Rose Ann. At the age of 100, Josephine decided it was time to go back to her home state of New York where she lived with her daughter, Toni Dier, and son-in-law Don Dier. Josephine was married to the late Anthony F. Noto on October 28, 1939. Their life was filled with love, laughter, and humility. Born on May 30, 1917, she was the daughter of Philip Anzalone and Rose Anzalone Melara, and stepdaughter to Charles Melara. Josephine is preceded in death by her brothers and sisters-in-laws, Sam & Lillian Anzalone, Philip Anzalone, Frank & Christine Melara, Joseph & Jeanette Melara, and brother-in-law, Vincent Marzano. Josephine and her daughters were affectionately referred to as “Mom and her four girls.” She is survived by daughters Rose Ann and husband, James Salvatore of Syracuse, NY; Nancy Mariotto of Ft. Pierce, Florida; Terri and husband, Don Brashears of Hilton Head Island, SC; Toni Lynn and husband, Don Dier of Utica, NY. She has three surviving siblings, sister, Grace Marzano, and brothers, Charles Melara, and wife, Shirley, and Ronald Melara and wife, Mary; all of Watertown, NY. Josephine was blessed to have lived to see five generations of her family including eight grandchildren (Gena Baker, Tony Mariotto, Michael Dier, Vincent Dier, Kim Bambeck, Christine Brashears Pitt, Jen Vogelman, and Steve Salvatore), sixteen great grandchildren, and two great-great grandchildren. along with her many nieces, nephews, cousins, and friends. As a lifetime member of St. Anthony‘s Catholic Church in Watertown, NY, she to the very end remained close to her church family. Josephine will be remembered as a kind, gentle woman with a strong faith, always positive and inspiring in her words and actions. Her love for life was reflected in her radiant smile letting us know we are loved. She would say daily, “I want to live as long as I can,” and indeed she did with dignity. Calling hours will be conducted at D.L. Calarco Funeral Home, 135 Keyes Avenue, Watertown, NY from 4 PM – 7 PM on Friday July 13, 2018. A prayer service will be held Saturday at 9:15 at the funeral home followed by a Mass of Christian Burial at St. Anthony’s Catholic Church at 10am with internment following at Glenwood Cemetery.